Located in the northeastern portion of Arizona is the remarkable uninterrupted rock landscape of Canyon de Chelly (de SHAY) National Monument. 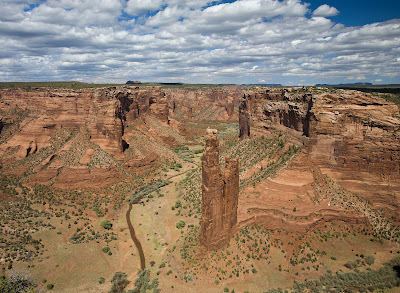 Canyon de Chelly borders the Navajo Nation and was recognized on April 1, 1931. This “little sister” of the Grand Canyon can boast many well-kept ruins and astounding views from its rim and between its canyon walls. 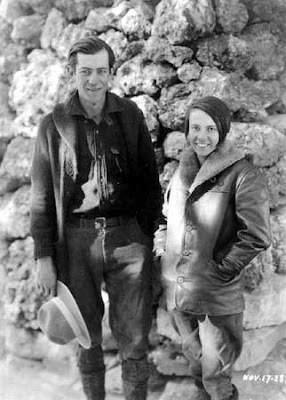 The name “Chelly” means “borrowing“ in Spanish and “Tseyl” (canyon) in Navajo. There are Native Americans who still live and farm surrounded by the canyon walls. Visitors can walk around freely on the rim but are only allowed inside the canyon with a guide. Here is the finished wraparound for our next Zombie Housewives book; Zombie Housewives of the 1960's. The very talented Cullan Hudson (http://strangestate.blogspot.com/) designed our first cover and this one as well. I added all the text on the back and designed the spine. 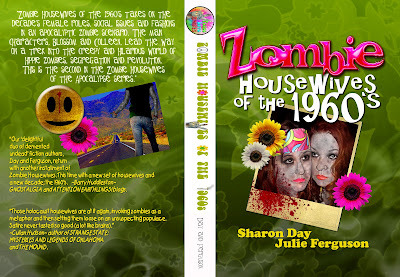 The 1960's book will have more content about the featured zombie housewives, Blossom and Colleen. Blossom is a hippie, proud to be a zombie, fights for zombie rights, and is living with two zombie men. Colleen is her younger sister, married to a human, and wrestling daily on living and existing in both worlds. Sharon and I are proud of this book and had a blast writing it. The book will be released on October 1, 2012. I know where you can pick up some cheap furniture, TVs and luggage. "Dry Creek turquoise is "beyond rare". Not only is it the palest turquoise in the world, but its raity is increased due to the mine being closed so there is little to work into jewelry. When it was discovered and found to be such an uncommon turquoise and so pale in color, the Shoshone Indians named it "Sacred Buffalo Turquoise" after the legend of the white buffalo. Authentic Dry Creek or Sacred Buffalo turquoise should never be confused with other stones that are called "white buffalo" which are actually howlite, magnesite and other white stone that usually have gray and black matrices in them." 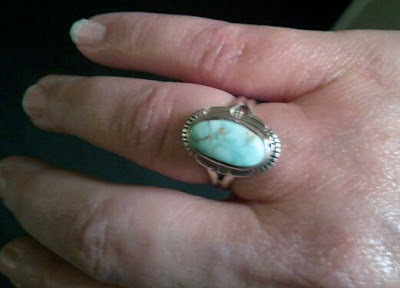 I purchased this Dry Creek turquoise ring while vacationing in Sedona, AZ. Located in the northeastern portion of Arizona sits an interesting rock formation known as "Window Rock". It is called "Tseghahoodzani" by the Navajo, which means "the rock with the hole in it". The Navajo revere the rock as holy and symbolizes the capital of the Navajo nation. 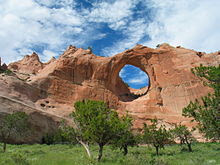 The huge sandstone rock stands about 200 feet, with a forty-seven foot hole in the center. There are myths handed down through generations that tell stories of why the hole is in the rock. One fable is the wind blew the opening when the world was being created. The Navajo feel that a colossal snake formed the round gap and would slither through it while hunting for food. They also believe that the rock's cavity is getting larger because the huge worm still exists, using the hole, and is growing larger. Whatever the story really is, Window Rock is an enchanting site to be seen. This old pueblo ruin located near the outskirts of Globe, Arizona, and is approximately 700 years old. Around 1225, the Salado Indians started the construction of the Besh-Ba-Gowah buildings, which are the ruins we see today. The name Besh-Ba-Gowah comes from the Apache language and means, “place of metal” or “metal camp”. 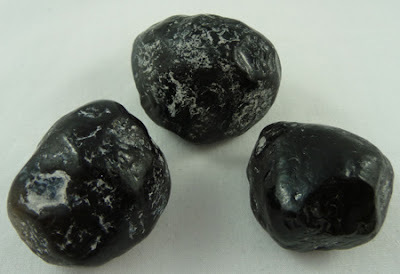 Apache Tears are natural crystals and a form of Black Obsidian Stone. This stone is usually found in the southwest and parts of Mexico. They are somewhat transparent and either a dark brown or black in color. These irregular shape stones get their name from an American Indian legend. Around the 1870’s the connection between the United States military and some of the American Indians, especially the Apaches, was tense and precarious. The military built many garrisons in hopes to keep the Apache under restraint. One of the forts built was Camp Pinal which is located near today’s Superior, Arizona. There were no written records, so what happened next was from many years and decades of stories. 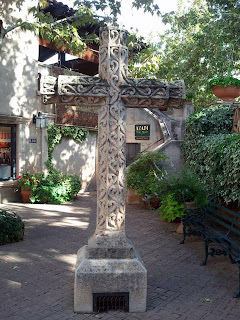 One of the things Sharon and I wanted to do while in Sedona was to find some of the vortexes which are located all around the city. We hiked up the red rocks along the airport road to the breathtaking views on top. There were several interesting piles of rocks near the vortex. We took in the views and fresh air, cleared our thoughts, and felt at peace. "A vortex is the funnel shape created by a whirling fluid or by the motion of spiraling energy. Familiar examples of vortex shapes are whirlwinds, tornadoes, and water going down a drain. A vortex can be made up of anything that flows, such as wind, water, or electricity. The vortexes in Sedona are swirling centers of subtle energy coming out from the surface of the earth. The vortex energy in not exactly electricity or magnetism, although it does leave a slight measurable residual magnetism in the places where it is strongest."